Hardwood floors become dull and dirty over time just like carpet, which is professionally cleaned to extend its life. Our exclusive hardwood floor cleaning process can breathe new life into your floors. Professional hardwood floor cleaning and maintenance can dramatically improve the appearance of wood floors and bring back their original luster. 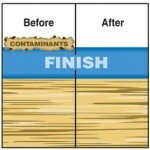 Our deep cleaning process removes the toughest dirt and residue, both safely and effectively. Commercial strength cleaning agents and innovative equipment lifts away buildup and rejuvenates floors for a fraction of the cost of repairing floors that are not professionally maintained. We use the Dirt Dragon Floor Prep and Cleaning Machine and Basic Coatings commercial grade cleaners to successfully eliminate dirt, dust, oil, and other contaminants that weaken hardwood floors and can lead to costly repairs. Our cleaning process doesn’t just clean the surface like most systems and products; it extracts hidden dirt deep within the boards of hardwood floors. Improve your air quality and circulation plus rejuvenate hardwood floors with the professional hardwood floor cleaning procedures that we provide. Aggressively cleans dirt, grease, hair, dust, built-up residue and contaminants. Aggressively cleans & refinishes the floor to a uniform sheen of gloss or satin. How much does it cost to have my wood floors professionally cleaned? We are happy to provide a free pre-inspection and price quote. We do not offer flat pricing since each home or business is different and comes with its own set of unique circumstances. There are many factors that can affect pricing. It is necessary to physically inspect and measure the areas to be cleaned to determine factors such as soil level, type of stone, amount of furniture to be moved, multi -level homes or businesses that affect ease of access, and exact measurement of area to be cleaned. 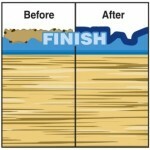 We also offer a re-finisher to be applied after cleaning at an additional cost. How often should I have my wood floors professionally cleaned? Scheduling a professional wood floor cleaning at least once a year is recommended, but it also depends on your regular maintenance schedule and techniques as well as the amount of traffic on the floors. Less often may be required if you have a great routine and if you re-apply finish after each cleaning. How long will it take to clean my wood floors? How long will it take for my wood floors to dry? It will be dry to walk on before we leave. If we apply refinisher it should be dry enough for “sock” traffic after 2 hours. Allow 24 hours before furniture is reset or pets are allowed on the floors. Yes. We will need access to a kitchen or utility sink. Purity Montana Cleaning & Restoration Services also offers Carpet Cleaning, Area Rug Cleaning, Window Cleaning, Gutter Cleaning, Tile & Grout Cleaning, and Interior Log Home Cleaning.